Abstract: The release of C5 helmet camera implied that Airwheel had formally entered the field of the wearable device. C6, based on C5 has its own features. Practical and recreational, Airwheel C6 motorcycle helmet was catching on to the public as soon as it was unveiled to the public. Being the first model of the wearable device by Airwheel, Airwheel C5 can be adequately hailed as a success, which implied that Airwheel had formally entered the field of the wearable device. C6, based on C5 has its own features. Practical and recreational, Airwheel C6 motorcycle helmet was catching on to the public as soon as it was unveiled to the public. Following such momentum, Airwheel rolled out C6 cool motorcycle helmet. During the ride, the safety comes first and this is the main purpose of C6 open face helmet. Its shell made of ABS material with the features of high impact strength, good stability and high level of electrical performance and abrasion resistance is to give riders the best protection. And the material is poly carbonate and inner soft side of the helmet is filled with quality epispastic material and can protect the head from being hurt by strikes or crashes. Also, C6 installs a caution light in the rear and it will keep flashing to remind the rear vehicle and pedestrian when the lighting is insufficient. After all, safety is the pre-condition of fun and happiness. The above is the practical purpose of Airwheel C6 helmet camera. Meanwhile, C6 has brilliant recreational functions. To begin with, Airwheel introduces the 2k high definition camera to C6. 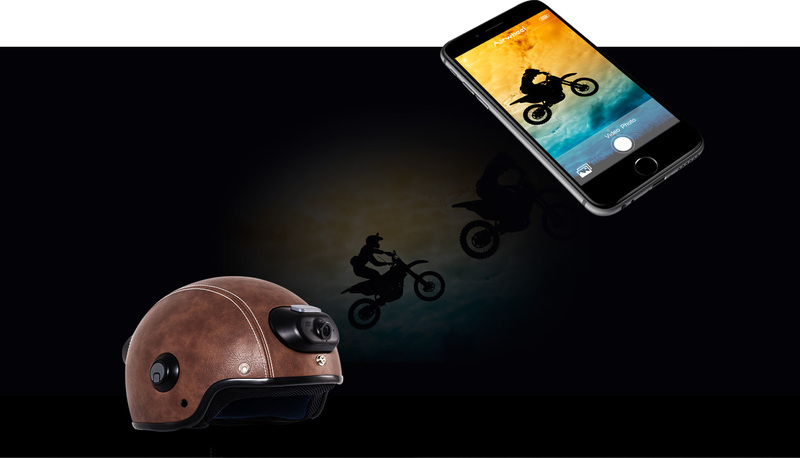 120° wide angle view, intelligent accompanying camera enables riders to take pictures or video. It creates a stable photography. At the same time, Airwheel C6 smart helmets has the ability to play music. The high quality Bluetooth speaker can enable riders to enjoy music and meanwhile to hear the external sound, ensuring that they are ready to deal with emergencies anytime. Additionally, the Bluetooth enables the rider to answer the phone hands-off. There is a small button on the left of the helmet. Softly pressing the button, the rider can answer the call easily without distraction. It is both the practical and recreational functions that make the Airwheel C6 intelligent helmet. Previous：What Makes The Airwheel Mars Rover World-Known?